Craig was born and raised in Spokane and was fortunate enough to attend Eastern Washington University for Physical Therapy, graduating in 1994. This has kept Craig close to his family and friends. 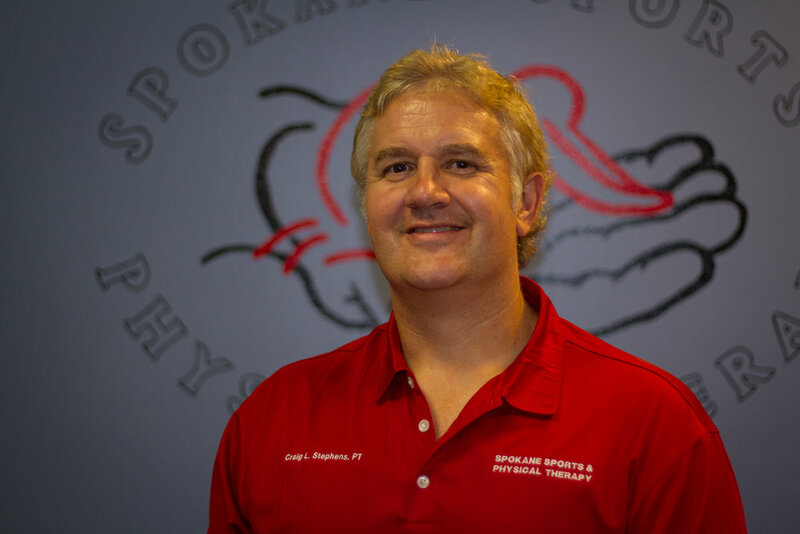 Craig opened Spokane Sports and Physical Therapy in January of 2001 and has continued to manage and practice since that time. He currently practices at the northpointe office. Craig has taken many advanced courses in evaluation and treatment of musculoskeletal disorders. He has an extensive background in treating injuries and repetitive problems resulting from work-related injuries. Craig specializes in post surgical shoulder rehabilitation and chronic shoulder problems. Craig has been an active youth coach for many years involving multiple sports. His background with athletics and coaching gives him a unique understanding treating and rehabilitating the injured athlete. Craig has also worked with patients and attorneys regarding motor vehicle injuries for many years and has gained extensive knowledge regarding these problems. Michael was born in Spokane and grew up most of his life in Yakima. While playing baseball and football, Michael battled through many injuries and spent some time going to sports physical therapy himself. It was during this time in sports therapy he began his interest in physical therapy. Michael got his B.S. in Exercise Science at Gonzaga University in 2009. Afterwards, he moved to Denver with his wife to continue his education and received a doctorate in physical therapy at Regis University in 2012. After graduation in 2012, Michael joined Spokane Sports and Physical Therapy. In February 2018 Michael and Craig opened the Downtown location where Michael currently practices and is the clinic director. Michael has done extensive research in regards to low back pain and has been published as an author in scholarly journals. His and his colleague’s research is currently being used as part of a treatment based classification scheme by therapists throughout the country. Michael has also spent 300+ hours in continuing education to be a certified orthopedic manipulative therapist (COMT) and also has an endorsement for spinal manipulation. While at Gonzaga Michael met his wife, Stephanie, and they got married in 2009 before they moved to Denver. In 2015 their son Jackson was born and they couldn't be more blessed to have him as their son. They are all happy to be in the northwest close to friends and family. Taylor graduated with a Doctorate in Physical Therapy from the University of St. Augustine for Health Sciences in 2016. Taylor has experience treating various orthopedic disorders such as vertigo, knee pain, chronic low back pain and numerous others. He has a strong manual therapy background from his training at USAHS, but also from being a massage therapist for 8 years prior to physical therapy. He received his bachelor’s degree from the Pacific College of Oriental medicine with a knowledge base of traditional Chinese medicine and massage. He likes to incorporate all he has learned over the years to help others achieve the health and lifestyle they desire. Taylor currently practices at the Northpointe location. Taylor moved to Spokane in August of 2017 from his hometown of Escondido, CA so he could experience more than just 1 season per year and work on both his golf game and go snowboarding. In his free time, he enjoys staying active with hiking, cycling, golfing, snowboarding, or whatever the weather will allow.